So many people out there think that all hair dryers are created equal, but we can assure you that isn’t the case at all. In fact, a bad hair dryer can cause serious damage to your hair over time. If you want to keep those locks looking as luscious as possible, you need to make sure that you use a high-quality dryer. Don’t worry, we’ve got you covered. 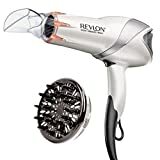 Revlon is obviously a leading brand in beauty and hair care, so it’s no surprise that the company makes the best hair dryer in the business. The Revlon 1875W Infrared Hair Dryer uses ionic technology to reduce frizz, and it couples that with infrared heat technology to ensure that hair stays soft and maintains its shine. So many people don’t even realize that there are hair dryers with stylers built right in. And once they realize this killer combo exists, it’s a complete game-changer. The Revlon One-Step Hair Dryer & Volumizer eliminates the need to use a conventional hair dryer in one hand and a styler in the other. Instead, the styler is the hair dryer and it blow-dryes your hair as you brush and twist it. This combo actually gives you more volume than you would get from a conventional setup, which explains why it’s so highly rated. The heading is a bit tongue in cheek, but the Dyson Supersonic Hair Dryer really is remarkably expensive for a hair dryer. As is the case with all of Dyson’s products though, it’s totally worth it if you can afford it. This futuristic high-end hair dryer looks like something out of a science fiction movie, and it packs features that you won’t find anywhere else. The Dyson Supersonic measures air temperature 20 times each second to ensure that temperatures are always perfect. It also has unique magnetic smoothing nozzle, styling concentrator, and diffuser attachments that are easy to change as you need them. Voloom Classic 1 1/2 Inch Volumizing Hair Iron. If you’re looking for a traditional hair iron to complement your hair dryer, Voloom’s Classic model is the way to go. BOLDIFY Hair Thickening Spray. Extra thickness and volume are just a few pumps away with this stylist-recommended thickening spray. 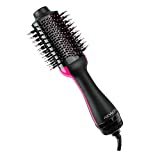 Conair Velvet Touch Paddle Brush. The Conair Velvet Touch Paddle Brush is just as good as $50 and $60 paddle brushes out there, but it’s available for less than $10. Wet Brush Pro Detangle Hair Brush. A good detangler is just as important to have as a good paddle brush, and it doesn’t get any better than this brush. 2 ALAZCO Folding Hair Brush With Mirror. Last but not least, never leave home without this collapsable hair brush and mirror combo.